and then add the diced onions. 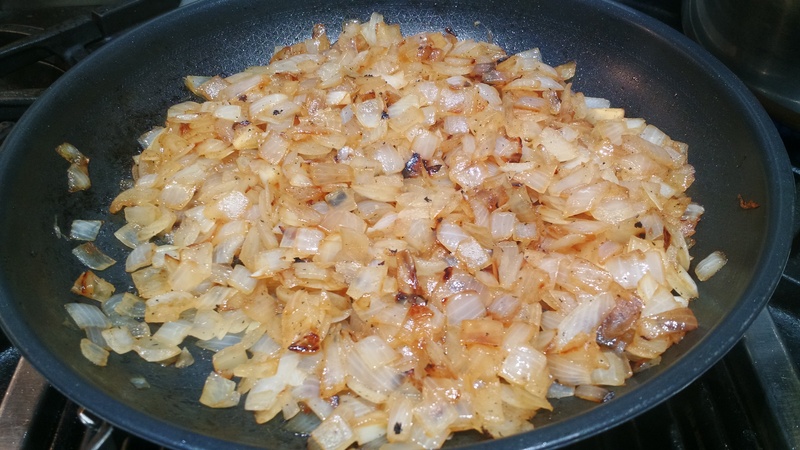 Saute the onions, &diamondsuit;ATTNstirring from time to time, not constantly. The onions need to get well-browned, and don’t worry if a few of them get extremely dark — that is what gives the kugel its flavor. Add a generous amount of salt and pepper to them as they cook: check by tasting them. Towards the end of the cooking, if there’s a lot of browned bits stuck to the pan, add 1/4 cup water to deglaze the pan, doing this while the onions are in the pan and the pan is still on the heat. These still need a little more cooking, but they’re almost done. Pay attention to how long the noodles cook: you don’t want them to get mushy and in fact, they should be a little firm but not doughy or raw-tasting. My brand’s package said they “should cook 8-10 minutes but no more than 8 minutes if they will be added to cooked more as part of another recipe”. I cooked them just over 6 minutes, sampled one and it was done. When the oil is hot, add the egg-noodle-onion mixture. Smooth the top of the mixture in the pan. As the kugel cooks, you should see a crust form around the edge of the pan: this might take 5 minutes or so. Run a knife around the edge to separate the kugel from the pan. 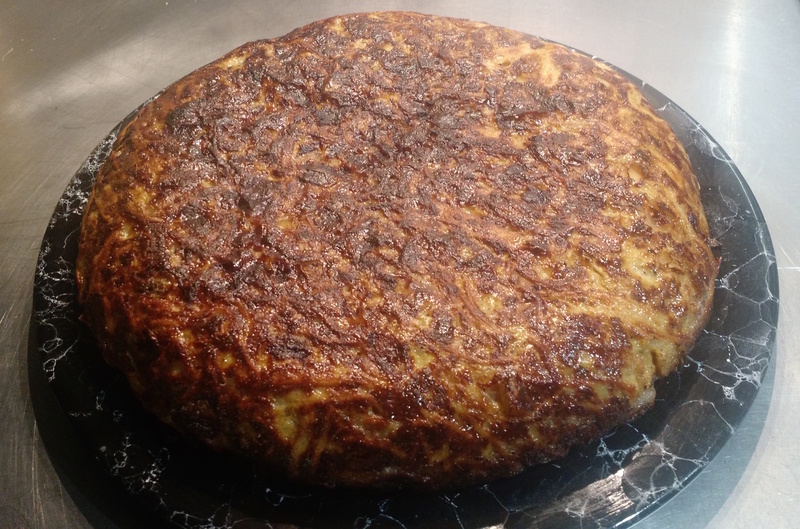 &diamondsuit;ATTNThe kugel will cook about 10-12 minutes on this side, so keep an eye on the heat and make sure it isn’t cooking too quickly as you’ll end up with a very dark crust. There will still be some loose eggs at the point you need to flip it, but not a lot. Before flipping the kugel, run a spatula or knife around the edge of the pan again and &diamondsuit;ATTNunder the kugel to make sure it’s not stuck to the pan. If the frying pan doesn’t have straight sides, you can probably shake the pan a bit to see that the kugel has been loosened. Put a suitably large plate over the top of the pan, invert the pan and plate together and hopefully the kugel will be on the plate. If part of the kugel sticks to the pan, remove it with a spatula and put it where it should be. It’ll be fine. to the pan and slide the kugel off the plate and back into the pan. The second side will probably only take about 7-8 minutes to cook. 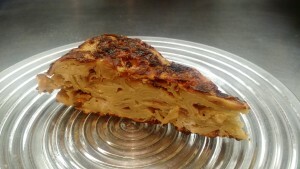 Again, &diamondsuit;ATTN loosen the bottom of the kugel from the pan and invert it onto the serving plate. 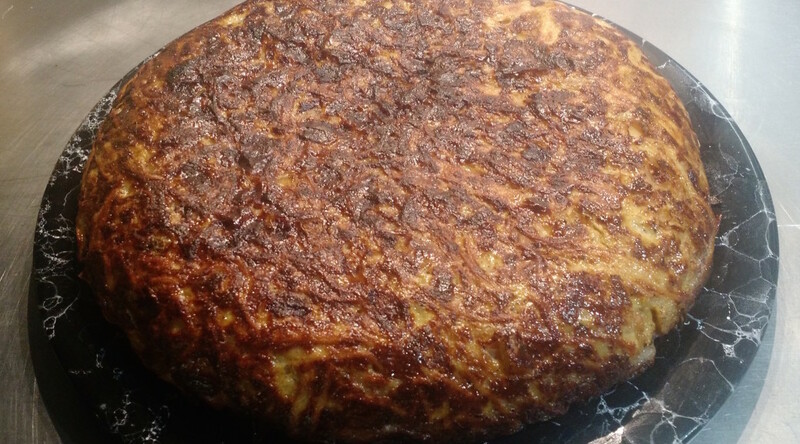 Note that if you had a “separation disaster” the first time around, it is hidden on the bottom of the kugel and no one will see it. This is a diet-sized slice. Serve hot or at room temperature, cut in wedges. It’s also great cold, eaten while standing in front of an open refrigerator at midnight. This is often served with braised meat (gedempte) that has a sauce. From my mother, Rita Fitterman, who probably learned how to make this from her mother-in-law, Goldie Fitterman.